Decal with opportunity make all 10 marking scheme of Sukhoi Su-33s aircraft from Russian Naval Aviation, which toop a part in Admiral Kuznetsov carrier mission in Syria. Decal consist Russian insignias, board numbers, badges and mission marks. . Attention! 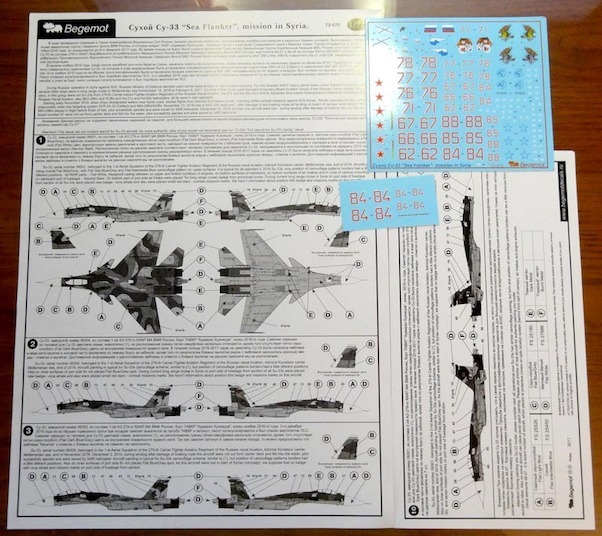 In this decal set not include stencil for aircraft and external armament, please use our decal 72-030 "Su-27 family full stencil". Including one big size decals and two-pages instruction.